Coubray-tone News, the work of the inventive Edward (Ted) Coubray, had its first public screening at Auckland’s Plaza Theatre. Filmed on location around the city, footage included the funeral of Catholic Bishop Henry Cleary, workers on Queen St and the Auckland wharves, and scenes from ‘The Romance of Maoriland’, which captured poi, haka and waiata performances. While the film does not reach the perfection in sound of American or British ‘talkies’, it must not be branded as ‘amateurish.’ The makers have not the same equipment as is available for foreign producers. 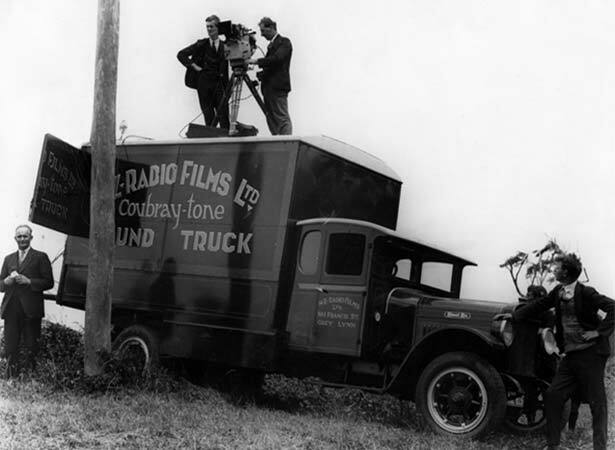 Filmmaker Coubray began developing his own sound-on-film system following the arrival of ‘talkies’ in New Zealand in early 1929. After six months’ experimentation, and at a cost of £3000 (over $280,000 today), the Coubray-tone sound system was operational. This entirely New Zealand-made enterprise was the first of its kind in Australasia. We have 3 biographies, 1 article, related to First New Zealand-made 'talkie' screened.